I am selling my handmade MJS Oval hole made by Godefroy Maruejouls in late 2012. 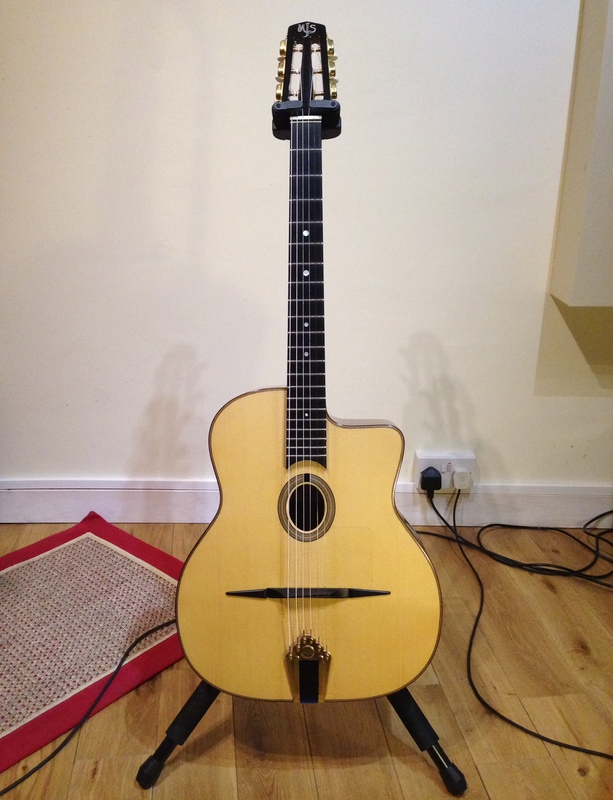 It's made from walnut back and sides and solid spruce top, ebony 14 fret fingerboard with KnK Gypsy Jazz mics fitted internally. It is finished in French polish to maintain good tone and projection. The guitar is in beautiful condition (rarely gigged) with a bright full tone and the classic gypsy bark that Godefroy always gets from his guitars. Price drop to US$3000/£1900. This guitar cost US$4000/£2600 new. Hiscox hard shell case included. More pics available on request. If you are in the UK you are welcome to try before you buy. is this guitar still available for buying ? No, sold a long time ago.